I did and much to my surprise my mother answered without hesitation - Saint Monica's. I had this conversation with my mother in 2010. To put this in context, Dotty first attended Saint Monica's in 1922. 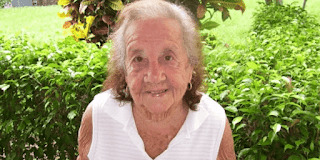 At the time of the conversation she was 93 years old; and, in the moderate to severe stage of Alzheimer's. To learn more about this episode go to this article - I Had to Remind Myself - My Mom Was Deeply Forgetful - and look for the story about half way down the page. I always suggest sitting at the kitchen table with a cup of coffee. You should turn your chair so that you are facing the person living with dementia. In other words, not at the other end of the table but adjacent if possible. Start with a smile and then go with the flow. When you ask your question make sure it is about something that happened long before the person was diagnosed. For example, my mother's middle name is Olive. So one day I asked my mom, what is your middle name? She responded, Olive dummy. I laughed. I continued, "so you were named after Aunt Olive?" Mom said, yes. I then proceeded to talk about Aunt Olive, and along the way I asked, what did you and Aunt Olive do in south Philly? And that got Dotty started telling me some stories about Aunt Olive that I had never before heard. Aunt Olive was a lovable and interesting character. She was older than dirt when I was a kid. So as you might have figured, she was long gone when Dotty and I had this conversation. 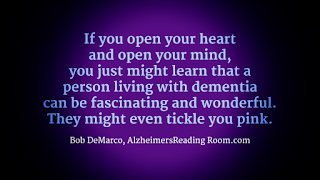 Don't ever ask a person living with dementia about what they had to eat today, or what they are going to do today. They won't know and they won't remember. That part of the brain and memory are no longer working. They no longer store this kind of information. Instead go WayBac. Go back at least ten years or longer. Ask about a favorite person, or ask about a great trip you made together. For example, Niagara Falls. Yep Dotty remembered that trip from 1956. Don't be afraid to ask, try it, and get the hang of it. If you know someone that like to talk (yak) invite them over. Give them the ground rules and let them go at it. My sister is a champion "yakker" and she could sit there and talk to Dotty for hours. Joanne also learned how to go with the flow. So if Dotty made up a story Joanne would just go along with her. Even asking her questions. 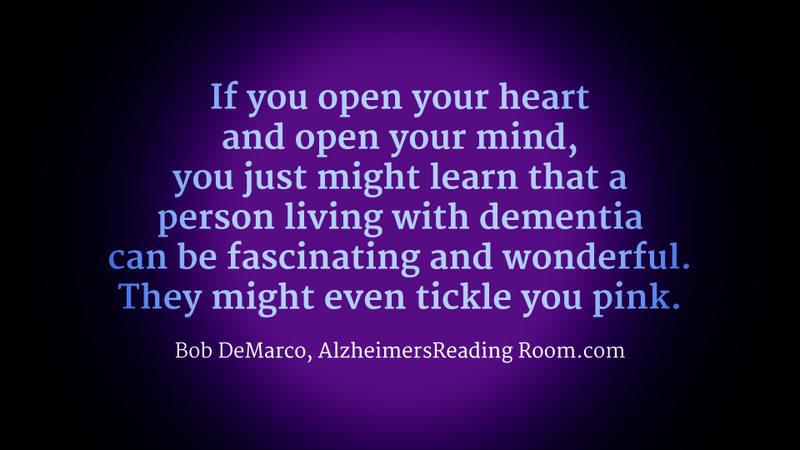 If you open your heart and open your brain you just might learn that people afflicted with Alzheimer's are full of all kinds of historical, funny, and useful information. You might also find that during some of those most difficult caregiving days the person living with dementia might perk you up. They might make you feel happy. When they do - open your heart. Take a moment to feel it. To feel like it feels. Take it in. Some kind of wonderful at times. It happened to me over and over; and it can happen to you.